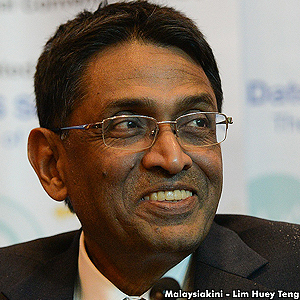 Malaysiakini : COMMENT | It is indeed shocking to know that the leader of the MIC and current Health Minister Dr S Subramaniam would support the withdrawal of amendments to the Law Reform (Marriage and Divorce) Act of 1976. Subramaniam said that it would be wise to focus on other amendments that would not require constitutional amendments as a way forward on the issue of the unilateral conversions that have plagued the nation. Since the amendments involving Section 88A will go against the constitutional provision of allowing for a single parent to convert his or her child, such an amendment would require a two-thirds majority. Minister of Tourism and Culture Nazri Abdul Aziz also remarked and even defended that withdrawal of Section 88A on the grounds that such an amendment, if tabled in Parliament, might not get the support of the opposition and would put the government of the day in a bad light. If the amendments get rejected in Parliament by the inclusion of this controversial Section 88A, it would mean that the government of the day will lose its confidence. BN politicians are suggesting that the non-inclusion of Section 88A in the amendments will be way forward as there are other issues that might bring relief to those families affected by unilateral conversions. There are six other amendments that would not require changes to the constitution but will be nonetheless effective in addressing issues pertaining to unilateral conversions and their effect on families. For instance, the amendments to allow for the dissolution of civil marriages, provisions for the seeking of custody of their children, distribution of assets and others might be a way forward for families.Subramaniam and Nazri are trying to defend the BN government for withdrawing the bill on the grounds that the government might not get the necessary support and, what is more, the Section 88A contravenes the Federal Constitution. However, both of them don’t realise, or pretend, that the key or fundamental issue in the bill to amend the Law Reform (Marriage and Divorce) Act of 1976 is the issue of unilateral conversion by one of the spouses. This is in accordance with the Federal Constitution, a provision that is the main cause of worry and misery of those families affected by the unilateral conversion. The case of Indira Gandhi and many others point to the fact that it is this provision that has emboldened the one-side conversion of the children. Thus, rescinding this very relevant section from the bill makes no sense. Without Section 88A, it would be pointless to bring relief and comfort to families affected by the conversion of one spouse and the subsequent conversion of the children. DAP, with its 36 Members of Parliament, are ready to support the government bill if reintroduced with the inclusion of the Section 88A. Without this section, the bill is empty and meaningless. Having contemplated and discussed the bill for some time, the government cannot turn around to give the lame excuse that the bill might not get the support of the opposition. It is not about getting the support or non-support but that the BN government, in facing the next general election, is afraid to offend Muslims in the country, particularly its new found friend, PAS. BN non-Malay component parties are either silent or supporting the withdrawal of the bill by saying that it is better to "pluck the low hanging fruits" first. This is a complete nonsense and total betrayal of non-Muslims by political parties such as the MCA, Gerakan, MIC and other mosquito parties.